KTR Promotions in Venice Beach & Los Angeles California: Celebrate the Holidays with Kat & the Blues Hounds, Wed, Dec 18th at the Melody Bar & Grill! 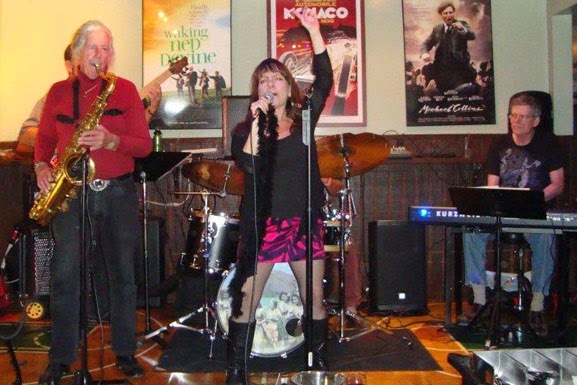 Celebrate the Holidays with Kat & the Blues Hounds, Wed, Dec 18th at the Melody Bar & Grill! Kat and the Blues Hounds rock out with a FREE holiday show this Wednesday, December 18th at the Melody Bar and Grill in Westchester. If you have never seen this energetic little dynamo, Kathy Leonardo puts on quite a show. Her vocals are astounding....Leonardo has gathered a group of incredible talent to represent her Blues Hounds. FREE music from 7-10pm. There's a wonderful happy hour that ends at 7 pm....right when the music starts...so plan on arriving at 6:30pm and order up! Kat and the Blues Hounds will be performing holiday songs, classic blues and some jazz too. We've got special guests along with our usual great lineup....Bob Crickmore on Keys, John Wiemken on bass, Rick Bryan on Drums, with Lucky Wright on sax! Melody Bar is located at 9132 S Sepulveda Blvd Los Angeles, CA 90045-4804, between W. 92nd St and Westchester Pky. If you are coming from the Westside, be sure to keep your eyes open and make a left turn before you see the In and Out Burger (on right)...if you miss it pull over and park, since you will end up past LAX, since you CAN'T turn left, due to a medium that divides the traffic on Sepeluveda. This is a FREE Musical Event...it runs from 7-10 pm on Wednesday December 18th!